In this video interview, Dr. Janet Courtney discusses how many Play Therapists are trained in methods that intervene at the symbolic level of play. However, it’s the pre-symbolic level of play, or FirstPlay®, that sets the foundation for on-going healthy emotional and cognitive development. And, unlike symbolic play, FirstPlay® type activities can only happen in relationship with another—such as the infant game of peek-a-boo. These joyful experiences release the hormones necessary to wire the brain for life-long secure attachment relationships. At the same time children learn to develop a bodily sense of self and an internal core sense of “I” or a ‘home” within. What happens when infants do not receive those vital FirstPlay experiences? Since John Bowlby introduced Attachment Theory, many studies have examined several variables that can impede the development of secure attachments. However, modern technology has posed a new clinical challenge—CYBERBABIES, as coined by cyber-psychologist, Mary Aikin, PhD, is a new threat to the development of secure attachment relationships, potentially leading to what she calls an “evolutionary blip” in our human development. Join Dr. Courtney as she discusses this concern that impacts the work of Play Therapists and what you can do about it to make a difference. Explain the difference between symbolic and pre-symbolic play. Describe at least two reasons why technology is a threat to secure attachment relationships. Name three FirstPlay® type activities that play therapists can implement to guide parents in an Infant Play Therapy session. This was great!! I am a grandmother and a newly certified counselor. As I listen to this, problems my adult step children have are making sense. I find that it is a call to action for the grandchildren that they are parenting. Thanks so much!! Excellent references, studies and implementation were given throughout this webinar. Janet Courtney, PhD, LCSW, Registered Play Therapy Supervisor, is Founder of FirstPlay® Therapy and offers a Certification to Practitioners in FirstPlay® Infant Story-Massage and FirstPlay Kinesthetic Storytelling®. She is an Adjunct Professor at Barry University, Miami, FL where she also obtained her Doctoral degree conducting research in Developmental Play Therapy, touch and attachment. She is Chair of the Association for Play Therapy Ethics and Practice committee and past President of the Florida Association for Play Therapy. Dr. Courtney is author and co-editor of the groundbreaking book, Touch in Child Counseling and Play Therapy: An Ethical and Clinical Guide, and is published in the International Journal of Play Therapy (2014 & 2018), the Journal of the American Art Therapy Association (2011), and the Journal of Therapeutic Horticulture (2014). Other publications include chapters in the books, Environmental Expressive Therapies: Nature-Assisted Theory and Practice (2017) and in Play-based Interventions for Children and Adolescents with Autism Spectrum Disorders (2012). She has developed a new attachment-based play therapy model of storytelling called FirstPlay Kinesthetic Storytelling® which merges skills of mindfulness with joyful first-play interactive parent-child activities. Her children’s book, The Magic Rainbow Hug©, makes this model directly accessible to professionals, parents, and the children who can most benefit from its use. 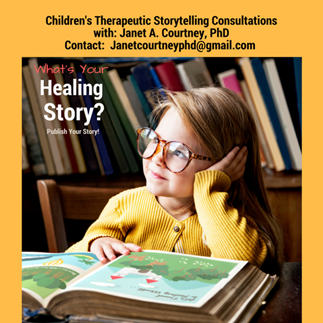 As a wholistic oriented practitioner, Dr. Courtney believes in the power of therapeutic storytelling, nurturing touch interactions, and joyful “first-play” activities between parents and their infants and children as vital foundations for healthy growth and development and to heal and repair relational bonds. Dr. Courtney has acted as a consultant to several Florida based children’s agencies, and supervises clinicians seeking Florida board licensure, as well as, those seeking Certification as a Registered Play Therapist. She is an internationally recognized play therapist and has been invited to speak and keynote on topics of infant and childhood play therapy in England, Ireland, Morocco, Russia, Ukraine, and the Cayman Islands. Because this course will allow practitioners to become Certified FirstPlay Child Practitioners (and that certification is provided by and maintained through Dr. Courtney), all APT contact hours are provided through Dr Courtney at Developmental Play and Attachment Therapies (APT Approved Provider 10-287). Jennifer Taylor Play Therapy Services is an Approved Provider with the Association for Play Therapy. (APT Approved Provider 12-331); however, no credit is being provided through Jennifer Taylor for this specific course. Play therapy credit available to mental health professionals only as listed in each course description. Courses that do not qualify for play therapy credit are clearly listed. This course is co-sponsored by Jennifer Taylor for 30 hours of NBCC credits. Jennifer Taylor has been approved by NBCC as an Approved Continuing Education Provider ACEP No. 6928. Programs that do not qualify for NBCC credit are clearly marked. Jennifer Taylor is solely responsible for all aspects of the programs.